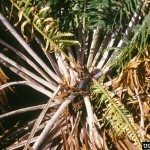 I have a mature male sago palm that had two seed pods this summer. Both dropped off and are now producing fronds. I really don't want two plants developing, so do I just cut one off? Will that damage the entire plant? Thank you. Yes, you can prune it.